1. As a writer and artist, Liam Lynch is both dyslexic and two types of color blind. 2. Liam holds a Guinness Book World Record for his song “United States of Whatever.” It is the shortest length song to go top ten in the UK clocking in at just 1 minute and 25 seconds. 3. Liam tested autonomous robot AI for Sony when they introduced their now defunct “AIBO” robot dogs. Liam still has the early prototype version of the robot. 4. On Queens of the Stone Age album “Era Vulgaris,” the song “Make It Wit Chu” features Liam Lynch singing the choruses “I wanna make it… I wanna make it wit chu” in falsetto with Josh Homme. Homme has had Lynch add backing vocals on occasion because of his high vocal range, including backing vocal tracks on Homme’s other band The Eagles of Death Metal. 5. 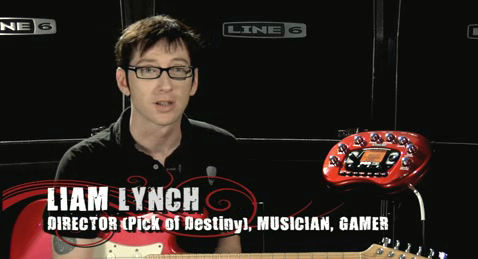 Liam Lynch can be seen as an extra video bonus in past versions of the Guitar Hero video game. He explains equipment he uses by the company LINE 6, who developed all the guitar tones for the game to match the various musicians they needed to mimic. 6. Liam has five cats. At one time he lived with seven. 7. Liam Lynch is a life long Doctor Who fan, having watched the series since he was a boy in the 1970’s. He continued to watch and collect episodes and memorabilia from the show into adulthood before the show was successfully revamped. He was attending Doctor Who conventions even while the show wasn’t on the air. Before the new Doctor Who series started, the shows producers asked Lynch to submit his own version of the Doctor Who theme song. Although his version wasn’t used he was nonetheless thrilled to get a chance to submit his take on the song. BBC provided him with all the original raw tracks from the original theme song, composed by Ron Grainer in 1963. Lynch was asked by the BBC because he had added Doctor Who references in many of his interviews and television appearances and even dons a Tom Baker scarf in his video for United States of Whatever. 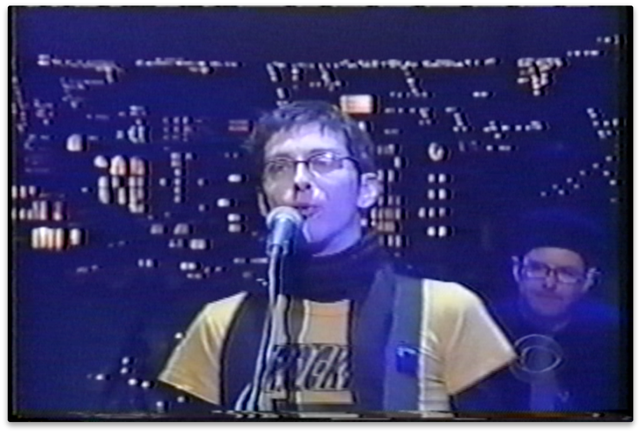 When performing on Letterman, Lynch wore a TARDIS pin on his guitar strap. When he appeared in Rolling Stone magazine, he included Daleks in the photoshoot. For his version of the Doctor Who theme song Lynch used no loops or keyboards. He played all the parts on guitars and his casio guitar. 8. Before moving to Liverpool, England to study music, Liam Lynch was a dishwasher at a restaurant in Nashville TN. Lynch has also worked at Blockbuster video, on the line in a carwash, in a box factory, in a wax museum, and as a telemarketer. 9. Liam Lynch is an avid, life long gamer. He has played on most systems since the first Atari was released. For Lynch, video games are therapeutic. Lynch’s friendship with Jack Black and later Tenacious D, all started with gaming. Black would come to Lynch’s apartment every night and they would play Playstation 2 games until the wee hours of the morning. When the two wrote “Tenacious D in The Pick of Destiny,” Black was in New Zealand filming King Kong. They had all their writing meetings via Xbox Live meeting in private sessions playing racing games. Lynch showed his love of video games in his recent new Sifl and Olly episodes made for Machinima and the Nerdist Channel on Youtube. In “Sifl and Olly Video Game Reviews,” Lynch reviews fake video games. 10. Liam Lynch doesn’t drink alcohol or do drugs of any kind. 11. The tattoo on Lynch’s forearm is a Native American drawing of a bear paw. The stripes across the forearm are the fingers of the bears paw. 12. Liam Lynch is not able to burp. 13. Lynch recorded all the audio and shot all the video for the Sifl and Olly show in friends' homes. No “studios” were ever used to produce the program. 14. Liam Lynch has been an insomniac and night owl all of his life. The subject is often mentioned in his songs. As anyone with insomnia knows it can sometimes be a problem. The longest Lynch ever stayed awake without sleep was 4 days (three nights) during the making of season two of Sifl and Olly. 15. Liam created a video with his friend Dan Deacon called “Drinking Out Of Cups.” The video has had over 30,000,000 views on Youtube. Despite popular belief, it is NOT a recording of a guy freaking out on acid. In fact, neither Liam nor Dan do drugs. The soundtrack is a recording of Dan watching TV and randomly commenting on what he was seeing on the screen. 17. As a child, Liam Lynch’s favorite toy was a tape recorder. The love continues to this day. 18. Liam Lynch has never played a sport. He has no knowledge of any sports or rules in games. He also has never played card games or poker. 19. When United States Of Whatever hit the top ten in the UK and Australia, Lynch was asked to perform on the long running UK show, “Top of the Pops.” Lynch however was on tour with No Doubt filming them for a live DVD (which features Lynch interviewing them as a DVD extra). Since Lynch couldn’t make the show, he promised he’d send them a video to take the place of his performance. He hastily shot and edited the video for United States of Whatever in one day and got it to the show in time for it to air. To this day, that has been the official video for the song. 20. Liam animates and is also the voice of the character “Bulby” which most Queens of the Stone Age fans will know from videos and the cover of Era Vulgaris. 21. Liam Lynch first started Sifl and Olly while living in the UK. They first ran as shorts between programming on MTV Europe. Lynch made over 100 shorts for MTV Europe, Australia, and Africa which had run for two years before becoming a half hour show on MTV America. 22. Liam Lynch’s earliest creative influences were Steve Martin, Ernie Kovacs, The Beatles, Monty Python, David Bowie, and Doctor Who. 23. Pictures of Liam Lynch were used as inspiration in designing one of the aliens in the new Star Trek films. 24. Liam Lynch’s favorite animals are crows, zebras, and praying mantises. 25. Liam Lynch directed an episode of Sarah Silverman’s Comedy Central program (episode was “Face Wars”). Liam pitched the episode concept to Sarah and she and her writers ran with it and as a thank you, had Lynch direct the episode. During his time on set he gave the shows writers another an idea for a funny scene (utilizing one of the shows characters, played by Steve Agee) that would take place in an Asian massage parlor. The writers loved the idea and included it in an episode the following season. As a shout out in the opening shot for the scene, they named the massage parlor after Liam Lynch. 26. In 2006, Lynch cloned one of his cats. The clone cat, Finnegan Forcefield, is the sixth cat to ever be cloned and the last cat that has been cloned. Finnegan is now older than the original cat he was cloned from, Frankie Forcefield. The company that cloned the cat is now no longer cloning cats and was absorbed into its sister company Viagen. 27. Liam lived in a haunted building during his time in the Liverpool. 28. Because of his experiences living in a haunted building, both he and his wife enjoy paranormal research and have collected many recordings and videos of their paranormal experiences. Some of their videos are posted on their secret youtube channel under the name "The Spark Club". 29. Liam and his wife married in the wheel house of the RMS Queen Mary, in Long Beach California. A location they often go to for paranormal experiences. 30. Liam has spent years planting a large cactus garden. He has over 200 different cactus plants. 31. Liam has been feeding a family of crows every day for years. The family now knows his personal schedule and trusts him. The crows have also brought him small presents as a "tip" for the food. Liam has his crow family tattooed on his arm, taken from a photo of them in his backyard. The crow family can also be seen in his music video "Two Crows", on his youtube channel. 32. On the subject of crow tattoos, Liam has another crow tattoo on his forearm by world famous, tattoo artist Freddie Negrete. The father of the black and grey style of tattooing.